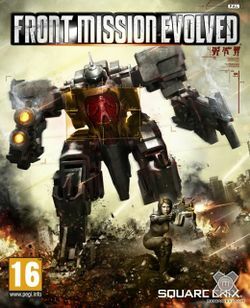 Front Mission Evolved was developed by Double Helix Games and published by Square Enix. It is set 50 years after the events of Front mission 5: Scars of the War, where there is a massive push for space exploration through orbital elevators. However, tension is sparked when one of the space elevator Percival is destroyed, bringing Dylan Ramsey into the war between the OCU and USN. This page was last edited on 2 October 2016, at 02:46.